The relationship we enjoy with our clients is a unique one. We work very closely together with them, often over a number of years. A good client can make even the most difficult project a pleasure, while a bad client can make the easiest a misery. Whether a client will be the former or the latter can often be sensed in the first meeting, but as with any relationship the full tapestry of her personality takes time to be revealed. The intensity and emotional involvement of the design and construction processes will mean we grow close to our best clients. While we may begin their projects as strangers, we often emerge as friends. One might expect such a critical element in the success of a project to be something we curate. However, while much effort on our behalf goes into describing what we do, what an architect is, very little in fact goes into explaining what a client does and is. Luck plays too large a part in this arena. We have had clients who understand very well the distinct roles of client and architect, but we have had others treat us like draftspeople or even servants. Perhaps some delicate role education would have prevented these misunderstandings from becoming so painful. Glenn Murcutt has said he expects his clients to work very hard on his projects, and we imagine he is certainly in a position to only accept those who are prepared to do so. But this statement is at least somewhat true for any positive client / architect relationship. We need a client to invest in her project, dedicate time and energy to it, so that we can better shape it to her needs, tastes and way of living. 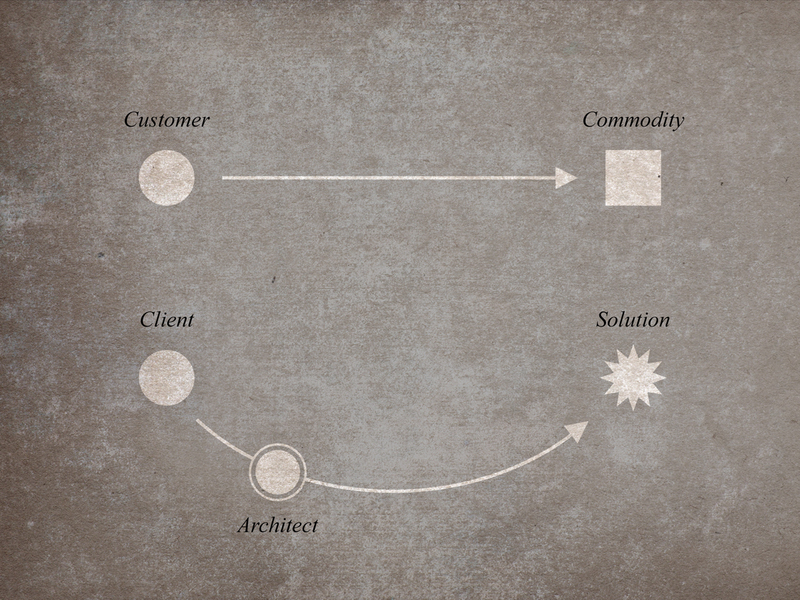 The client is not the same as the customer. Notice how the dictionary definition of the latter makes direct reference to a commodity, the entire nature of the customer being shaped by the good she hopes to purchase. A customer for a pair of jeans is by nature different from a customer for a wedding dress. The dictionary also makes no reference to the need for expert advice: when the customer walks into a store, she already knows what she wants, be it a car or a chair or a box of cereal. She has a problem (she’s hungry) and knows how to solve it (she buys a box of cereal). In contrast, the client is shaped not by the good she hopes to purchase but by her relationship to her service provider. Like the customer, she has a problem (she wants somewhere to live) but unlike the customer, she doesn’t know how to solve it. This is typically because the problem is sufficiently complex to require specialist expertise to solve. Thus she engages an architect to help her solve her problem, to provide the house she needs but cannot yet understand. So, a client is someone who has a problem that needs solving, but lacks the vision and expertise to do the solving on her own. We often think that an important part of the architect’s role is to provide guidance through the murky waters of design, so the further definition of a client as one who is under the protection of another resonates with us. The client solves her problem thanks to this guidance from, and in collaboration with, her architect. We have been in practice for long enough to have worked with an ever-widening variety of clients. Some are intensely involved with the design and construction processes, interested in participating in every decision and attending every site meeting. Others are much more hands-off. Some are remarkably design literate, while others can only read floor plans, and yet others only physical models. Some are confident in their decision making, others require extensive support and hand-holding. Some interfere with our work, second guessing and micro-managing us, others leave us alone to get the project done. She understands herself, her lifestyle, her tastes and her preferences. She is able to communicate these characteristics to us so that we may enshrine them in our design solution. She recognises that she is not a customer, that she does not know how to solve her problem. She has engaged us to do what she cannot and is comfortable with this relationship. She treats us not as an opposing force that must be managed, but as a partner in the shaping and execution of her dream and our design vision. She is honest with us, providing both positive and (constructively) negative feedback. She is also honest with herself, recognising that her budget and brief must be aligned with one another, a process of compromise that will require a great deal of self-reflection. She inescapably comes to us with a pre-formed picture in her head of how she imagines her project will be. But if we were to design that picture, we would not be doing our job as architects. Our mandate is to take that picture, understand its ambitions and qualities, and improve upon it. A positive emotional response to our design is ideal, but when our proposal differs from the picture in the ideal client’s head, trust in our vision is essential. She is not overawed by the quantity of decisions that must be made during the design and construction processes. She can review all the possible kitchen sink options, accept advice on the ones most suitable, choose, and move on without second-guessing herself. She understands that the construction of a building costs a considerable amount of money, and is prepared (if not necessarily overjoyed) to spend it. She is committed to design quality and appreciates that a work of architecture embodies relationships to history, culture, the city, the street, the natural environment and future generations. She is enthusiastic about our interest in these relationships and is committed to exploring them with us. She shares our architectural values of sustainability, craft and the sublimely utilitarian. She understands the difference between cost and value, and is willing to invest in good design. The importance of good clients has long been understood within the architectural community. Historically, the best relationships between architect and client have produced works of great art: from the Medici and their numerous patronages, to the Kaufmann family that commissioned Frank Lloyd Wright and Richard Neutra, to Denton Corker Marshall and their careful collection of jewel-like houses. When the symbiosis during the journey is right, there is no limit to the success of the destination. To paraphrase Murcutt again, the future of an architectural practice is more powerfully defined by the clients and projects we refuse than the ones we accept. We think he is referring here to the business of architecture. Good clients are vital to the ongoing financial success of a practice: they pay us now, and market us to their friends so that future clients will pay us later. As discussed recently, Neil and Murray Raphael’s loyalty ladder proposes two relationship tiers above client to which an architect can aspire: the advocate and evangelist. In a profession where repeat clients are rare and word of mouth is king, our clients’ preparedness to procure new projects for us is essential. Despite this understanding, the methods by which we might procure commissions from new clients – great or otherwise – are rarely discussed. Architects are, we believe, needlessly guarded about this subject. Rather than hoard this knowledge in an effort to gain a bigger slice of a shrinking pie, why not share it so that we can all get fair slices of a growing pie? We hope that by understanding what characteristics constitute the ideal client, we will be better armed to attract more of them. Dictionary definitions sourced from the Merriam-Webster online dictionary. Mr. 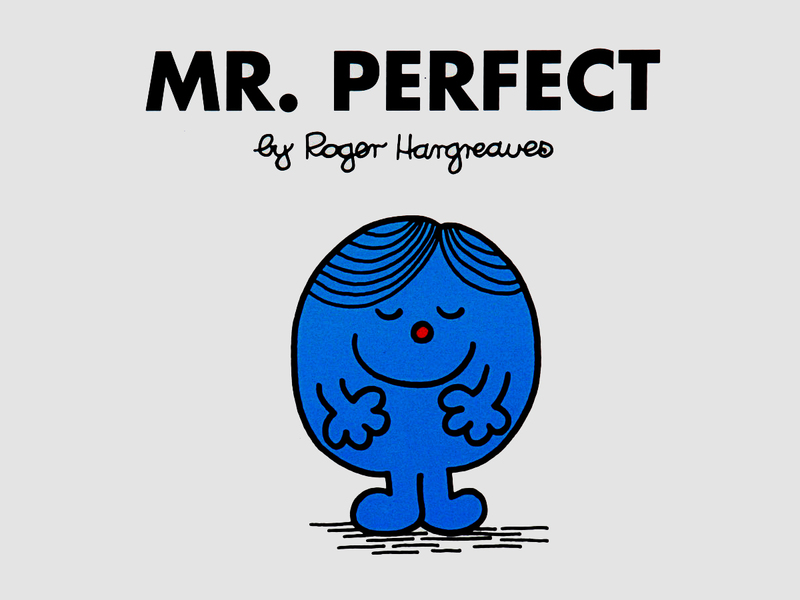 Perfect, Mr. Men. Copyright Roger Hargreaves. Journeys of the customer and client, author’s own image. Thanks for your positive feedback, Bronwen. I echo the sentiments of the previous comment. Your provide some very good reminders about who we should seek to collaborate and work with. I think what can be less predictable is the longer-term behaviour of clients throughout the entire project process – regardless of their ‘pedigree’, provenance, and alignment with the five points you make. We have had some clients whose decision making, appreciation of our capabilities and understanding of our role as their architect was ideal throughout all of the design, documentation, planning, even tendering and contracting stages…. until construction began and they started to spend their (or the bank’s) money. As they say, money changes everything. In the two worst instances I am thinking of, it truly was like a Jekyll and Hyde scenario such was the change in the client’s demeanour and indeed respect for us. We spent the entire Contract Admin stage being treated like we were a rung above the Devil in their estimations – even though we worked tirelessly work to keep everything smooth sailing (including hosing down unhappy builders and consultants), more than they will ever know. And in both cases, since the projects were completed and Defects period passed, we have retained contact with these two clients, one of whom in particular is so cheery and friendly to us, it is almost like the construction period of their project was some kind of extended schizophrenic episode of which they have completely and utterly forgotten. At the end of the day, one can hope that by sticking with the principles you describe that we can avoid these situations and stay focused on what is important for the makings of a great project. I remember working with a very demanding client prior to establishing Mihaly Slocombe that constantly rubbed me up the wrong way, complaining about our disbursed printing costs of all things. Eventually, I made a proactive decision to improve my quality of life and do whatever he wanted. It had a remarkable effect: he started treating my like royalty, couldn’t get enough of me, even bizarrely adding me to his joke email list. Another reminder that relationships are complex things, in any situation.